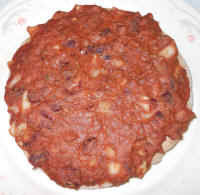 This quick and easy flat bread pizza with tex-mes beans is an inexpensive vegan recipe that can be made in the microwave oven at home or work in a few minutes from pre-prepared beans and fresh or frozen flat bread. 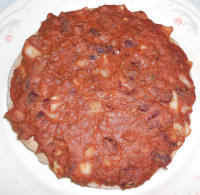 Place a flat bread on a microwaveable plate and spoon on the Tex-Mex bean topping to the thickness you desire. Place in the microwave oven on high until hot (about 2 minutes), being careful not to over cook, which can cause the edges of the flat bread to get hard. Experiment with the time on the first one, and all the others will be perfect. Remove from the microwave, cut into pieces as desired, and enjoy.